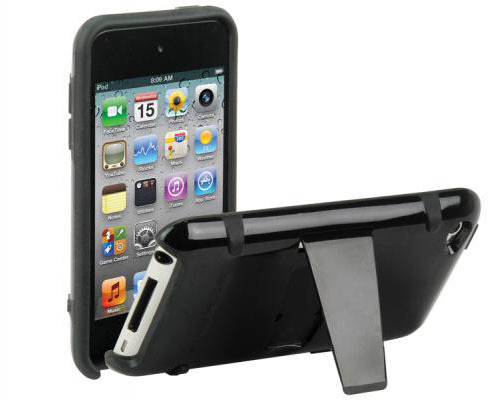 The newest kickBACK case with Kickstand by Scosche is now available for iPod Touch. The case has glossy polycarbonate exterior with flexible impact resistant rubber interior, and an integrated kickstand for landscape viewing. The open design allows full access to all connections and controls. The package also includes an ultra-clear screen protector and microfiber cleaning cloth. The kickBACK comes in three color combinations – black on black, white on gray and gray on gray.